Research shows that in the United States, un-processed foods are harder to access, more expensive, and less convenient than ultra-processed foods. Ultra-processed foods contribute to chronic diseases across populations. The 2017 Community Health Needs Assessment Report conducted for Gallatin, Madison, and Park Counties of Montana shows that a large portion of the local population experiences low access to healthy foods. The report also shows that lower income populations are less likely to eat enough fruits and vegetables for health and are more likely to eat ultra-processed sugar sweetened beverages than much of the general population. Food pantries play a big role in providing healthy foods to low-income populations. UP3 is a solution. How will UP3 be implemented? 1. Individual. Food pantries can play a role in providing nutrition education to clients. Study participants will meet with a registered dietitian for one hour at the beginning of the intervention to learn about the program. They will also go to nutrition classes and workshops to learn about un-processed foods and why they are important. Throughout the program, participants will receive un-processed food from the pantry to provide about 50% of a nutritious diet. 2. Food Environment. The environment within a food pantry has the potential to influence clients to select un-processed foods. UP3 will implement strategies such as product placement, packaging, marketing, and sensory appeal to help participants choose more un-processed foods. 3. Food Supply. The nutritional quality of foods supplied to food pantries can be improved by introducing policies that require donors, purchasers, and food banks to focus on more nutritious foods. The UP3 team will change the food pantries’ current policies to acquire more un-processed foods. 4. Individual Health. 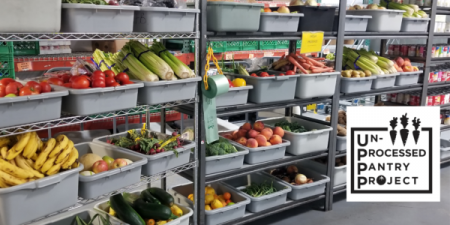 UP3 will take place from March through June (16 weeks) with 40 food pantry clients that volunteer for the study at the Gallatin Valley Food Bank and Livingston Food Resource Center. The UP3 team will track participant’s dietary intake and health measures to assess the impact of UP3 on health outcomes. UP3 is supported by an Institutional Development Award (IDeA) from the National Institute of General Medical Sciences of the National Institutes of Health under grant number 5P20GM104417.